Nutrition is defined as eating nutrient-dense, fresh, whole foods to nourish the body to enable it to live, grow, heal and stay healthy. I hope we all share the goal of eating nutritiously but this book adds to that simple one-dimensional goal. 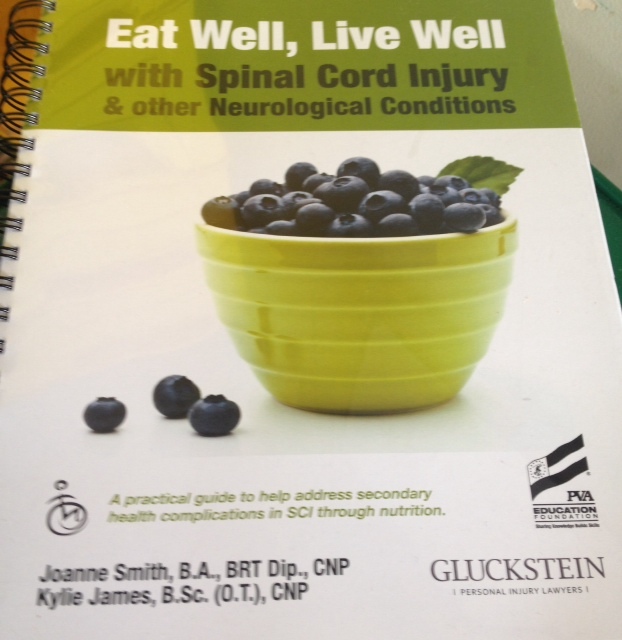 It breaks down medical conditions and why they develop after spinal cord injury (SCI), with an understanding of how nutrition can help prevent and manage these health issues. There are bullet point interventions, listed nutritional advice and recipes for each condition. Nutrition can become a complex affair but this book makes eating well accessible. The first instruction is “start changing your diet one meal at a time, don’t put pressure on yourself to try to change your entire diet at once.” Each chapter begins with clearly identifiable sections so that any-one with specific requirements can find the pertinent dietary advise easily. I loved the recipes within each chapter, they were appealingly simple with clear directions. I instantly wanted to try some as eating well, living well is a goal Emily and my whole family share. After just a short time reading through this well researched and colour coded manual I was writing a shopping list and reviewing my meal plan for Emily. This is a great book for SCI and it can be used within any family as it promotes healthy eating and a healthy lifestyle – that has to be good for us all. This entry was posted in Life after SCI, Lifestyle Choices, Medical Issues, SCI Diet and tagged Change, Diet, Everyday Caring, food and nutrition, Healthy choices, Nutrition, people with disabilities, spinal cord injuries, Wheelchair by everydaycarer. Bookmark the permalink.